Lyme borreliosis (LB) is the most common vector-borne infectious disease in Slovenia. From 3,000 to over 6,000 patients with LB were registered annually in the period 2005–2014 in Slovenia. Since the introduction of legally required registration of LB, the incidence rate has been increasing and is one of the highest in the EU. The increase reflects better recognition of the disease, awareness of the general population about symptoms and signs consistent with LB. We assume that lifestyle, i.e. living or working in the environment where there is a possibility of infection, is equally, if not more, important than the density of ticks and environmental factors. 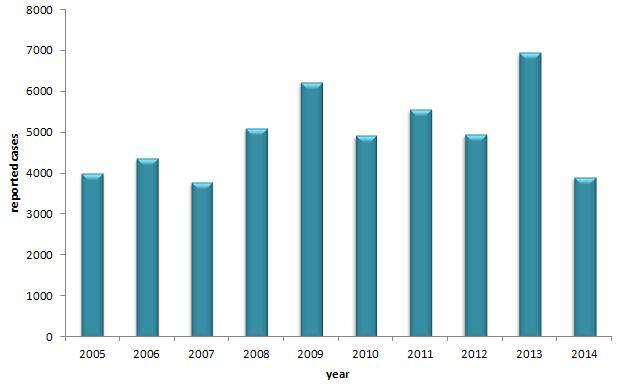 This indicator presents the number of reported LB cases (ICD-10 diagnoses: A69.2, G01.0, G63.0, M01.2). Lyme borreliosis (LB) is the most common vector-borne infectious disease in Slovenia. Climate change and temperature increase, in particular, has been attributed to having a considerable impact on the changing epidemiology of vector-borne (and other) infectious diseases. Lyme borreliosis is the second most important disease transmitted by ticks. As opposed to tick-borne meningoencephalitis, no vaccination against borreliosis exists for the time being. Lyme borreliosis is treated by antibiotics. The range of borreliosis is not limited to the areas known to be infected with tick-borne meningoencephalitis. Ticks throughout Slovenia are infected with the Lyme borreliosis agent. Usually there are three phases in the progression of the disease. It begins with a typical rash from 3 to 32 days after the initial bite that gradually spreads outward from the place of the bite. The rash typically pales in the centre. Usually there is only one rash, but there may be several on different parts of the body. The rash may disappear without treatment, but the infection continues. In the second and third phase (possibly several months or years after the initial infection) many organs or organ systems may be affected – skin, nervous system, joints, muscles and sometimes also the eyes and heart. based on the gathered data, provide information to the general and professional public in order to reduce the number of infections. Since the reporting of LB was legally introduced (Rules on the reporting of communicable diseases and specific measures for the prevention and control thereof), the reported incidence rate of in Slovenia has been on the increase and is one of the highest among EU countries or U.S. states where LB is endemic. In Slovenia, most cases were reported as erythema migrans (EM) and much less as of central or peripheral neuropathy or inflamed joints due to infection with Borrelia burgdorferi. Slightly more women than men were reported to have been infected. 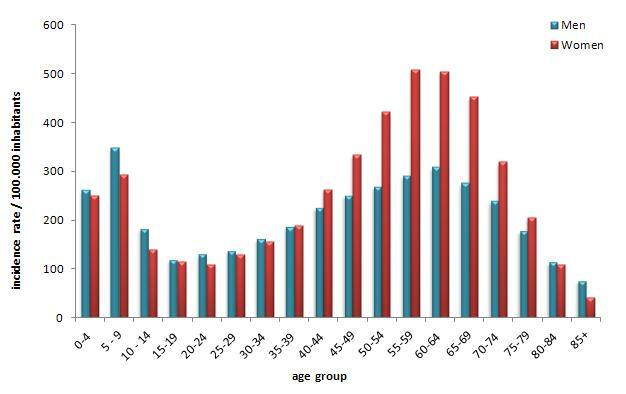 The highest infection rate was observed in the age group 50–69 years and in children aged 5–9 years. Comparable epidemiologic characteristics have been described in papers by Slovak, German and other European authors, while in the USA, LB is more common in men and the highest incidence rate is recorded in children aged 5–14 years (Rizzoli, Hauffe, Carpi, Vourc, Neteler, Rosa, 2011). The occurrence of LB (and other tick-borne diseases) is affected by biotic, abiotic and social factors. An increasing number of reported LB cases may be a consequence of the expansion of the diseases to previously non-infected areas, a higher percentage of infected ticks and environmental changes that improve the survival rate of ticks and natural reservoirs of diseases. Climate change and increasing temperatures, in particular, are considered to have a notable impact on the changing epidemiology of vector-borne (and other) infectious diseases. In the previous decade, higher mean air temperatures in early spring doubtlessly caused earlier activity of ticks and thus an increased possibility of infection with LB as early as March and even February. The effect of hot, dry summers is the opposite: activity of ticks is reduced and, consequently, infections in humans are less likely. Environments inhabited by humans influence the distribution and prevalence of tick-borne diseases. Compared to rural environments, highly urbanised environments carry a much lower risk of infection with vector-borne diseases. However, infection with borrelia may also occur in urban environments (lawns, city parks, suburban gardens, etc. are potential habitats of infected ticks). Slovenia is a country with a low urbanisation rate – according to the Organization for Economic Cooperation and Development (OECD), Slovenian regions are classified as rural or intermediate, while none of the regions is urban. In accordance with EUROSTAT recommendations, only two municipalities are considered to be densely populated, while others are mostly sparsely populated (Statistical Office of the Republic of Slovenia, 2007). In Slovenia, forests are expanding, while the land area of grasslands, vineyards and arable fields is decreasing. Forested areas have been expanding since the mid-19th century. Today, forests cover almost two thirds of the country. Forests in Slovenia are mostly characterised as highly or moderately fragmented, which has a positive effect on biodiversity, while on the other hand, forest biotope is expanding toward human settlements. The dispersed settlement of the Slovenian population in forested landscapes that provide a suitable environment for ticks, small mammals, birds and other animals is an important factor determining the frequency of vector-borne diseases, including LB (Sočan, 2012). The share of agricultural land is decreasing, along with the number of people involved exclusively in agriculture, who are more susceptible to infection with borreliosis. On the other hand, as poverty is increasing in Slovenia, the percentage of people who try to grow their own food or gather forest products is also increasing, along with their exposure to tick-borne infections. A healthy lifestyle that includes recreation (walking, sports) in the natural environment also contributes to increased exposure to infections. In order to understand LB epidemiology, all factors affecting its geographic distribution, prevalence and the time of occurrence must be taken into account. Lyme borreliosis is not yet on the list of infectious diseases reported to the European Centre for Diseases Control and Prevention (ECDC) using the same methodology, which makes its international comparison impossible.